Out of all the precious metals out there, gold is the one that stands out. It is highly sought-after and appreciated by millions from all around the world. It is interesting to learn new things about gold since you will surely be surprised to notice the state of the gold mining industry. The infographic that you see below can bring in a lot of information that will make it much clearer for everyone why this is a metal that is so popular. Ever since gold was discovered, over 170,000 tons were mined. Out of all the gold, 50% is used for jewelry and quite an impressive 40% is used for financial investments, which is a lot more than many believe. It is also worth looking at the top 7 countries by production of gold. You will definitely be surprised to notice that the top producer is China, closely followed by Australia, the US and Russia. Is there any surprise that these (except, maybe, Australia) are such strong countries from an economic point of view? Although China is a huge producer, the top 2 largest gold companies are Canadian. Barrick Gold has a market capitalization of 49 billion USD. This is quite a lot given the fact that ever since 1970 we saw an increase in gold value, with 2000 to 2012 being really huge in terms of growth. Whenever talking about money, we need to think about gold since it is a huge part of the financial industry. 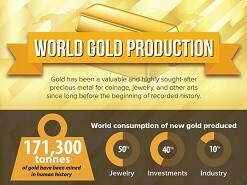 The World Gold Production infographic helps you to understand where we stand at the moment. It is expected to see a stronger struggle in the future as the metal deposits go down but if new deposits appear, prices for gold will end up being a little lower. Until then, gold value keeps growing and out of all the different investment opportunities, those in gold do stand out as being among the really stable ones that can be considered by those that have the necessary capital. Even those that do not have a lot of money can seriously consider investing in gold. It is something that you will want to look at after you check out the infographic.